Have you heard of Allbirds? Mary Meeker, Partner at Kleiner Perkins, mentioned them in her highly-coveted Internet Trends report–a fascinating 300+ slide deck that I read every year. After I saw it mentioned in the VC report, I started reading more about Allbirds, a footwear brand that launched March 1, 2016. I wondered what all the fuss was about and figured I’d order a pair online when I saw that their only retail location is located one block away from my work. SCORE! When I went, the store was MOBBED. There’s limited selection, which makes it easy. 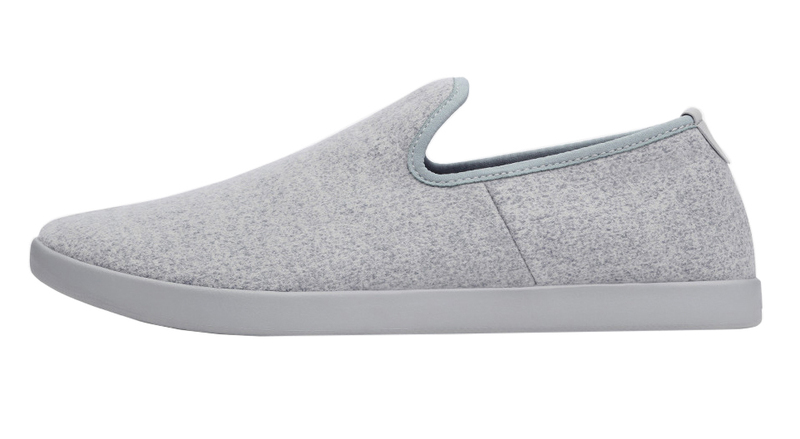 You can either buy running shoes or slip-on loungers in a handful of colors. Made from superfine merino wool from New Zealand sheep. Turned into fabric in an Italian textile mill. Shipped in its own shoe box, which minimizes packaging. Since my purchase one week ago, I haven’t worn any other shoe. I don’t want to take them off; they’re so comfortable. The only wrinkle is that I tried on two different colors and the black lounger felt tighter and less comfortable than the grey lounger. I have no idea why. But my suggestion is to order at least two colors to make sure it’s exactly the right fit. The one pictured above is the one I bought. Of if you’re local, go check out the retail store. 99 Hotaling Place, San Francisco–half a block from the Transamerica Pyramid. Do you own these shoes? Have I convinced you to try a pair? And I wish I was still local to get some myself. They look AWESOME. I checked out their site and I liked the grey wool for men. Hope all is well with you, momma! Sending much love!! Sheesh. I need this in my life! Hope I can find something like it here that is as comfortable. I am all about comfy shoes. These are right up my alley. I love the low profile too. Not chunky or heavy looking. These are adorable! I like the tie version in gray. I’ll have to remember these when the weather gets cooler.